« Slide Guy! Goes to the Farm on Flickr.Slide Guy! is awesome! Start the week off by learning a bit about (or a bit more about) the Creative Commons (CC) movement and how it relates to our notion of copyright and intellectual property. It’s up to you this week to do the research on this topic! Use the power of the Web to learn more about CC and copyright — don’t worry there are TONS of materials online about this topic. We’d like to see what you find and come up with on your own. When you’re done, write up a blog post in which you share your research findings — what exactly is Creative Commons? In addition, let us know what Creative Commons resources you found most useful and informative. Finally, share your thoughts about how you’ll be licensing your work for this class from here on out — and let us know why you made this choice. Tag this post ds106CC. After reading and reviewing the assignment document, you should be able to provide a basic explanation of each of these concepts. Review this information about how to take (and find your saved) screenshots in Minecraft. If you are in survival mode (in other words, you are dying!) in Minecraft, tweet me (@mburtis) ASAP so that I can get in with you and change your player mode! It will only take a minute. Complete the remaining six stars of your work with any assignments of your choice from the Design section in the Repository. As with last week, each assignment must be blogged! Don’t forget to review Alan’s tips of how to write-up assignments like a pro. Tutorials and Assignment Ideas — REMINDER! Create Assignments (10% of your grade): You must create and complete two new assignments for the Assignment Repository. That means YOU come up with the assignment idea and submit it. Then you must actually DO your assignment and tag it appropriately (based on the tags that are assigned as soon as you submit your idea). Create Tutorials (10% of your grade): You must complete two tutorials for assignments in the Assignment Repository. Write an extended blog post in which you give us detailed instructions about how to complete an assignment. Include screenshots, videos, etc. to explain your process! Make sure you tag your tutorial with the appropriate tutorial tag (these are listed on the right-hand side on each assignment page). While these are not required this week, they are required by the end of the semester, and it is up to you to remember to get them done. Consider yourself reminded! Campfire this week will be at a BRAND-NEW time and location. We’ll be meeting on Wednesday, 6/11, at 7:00 EST in Minecraft, using TeamSpeak. That means, you need to get up and running with both, ASAP in order to participate. We strongly encourage you to try and join us, if you haven’t already! This week Daily Create is OPTIONAL. Consider the Design Safari the substitute this week for Daily Create — of course you’re still welcome to complete creative prompts whenever you like! 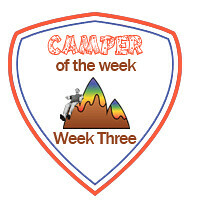 UPDATE: Campers of the Week! And for these folks, a very special Slide Guy! Edition of the COTW Badge! This entry was posted on Monday, June 11th, 2012 at 7:04 pm	and is filed under Announcements, Uncategorized. You can follow any responses to this entry through the RSS 2.0 feed. Both comments and pings are currently closed. I feel like I’m missing time here. It was Week 2 then like an X-Files re-run, it was the middle of Week 4 and I woke up back in my office.